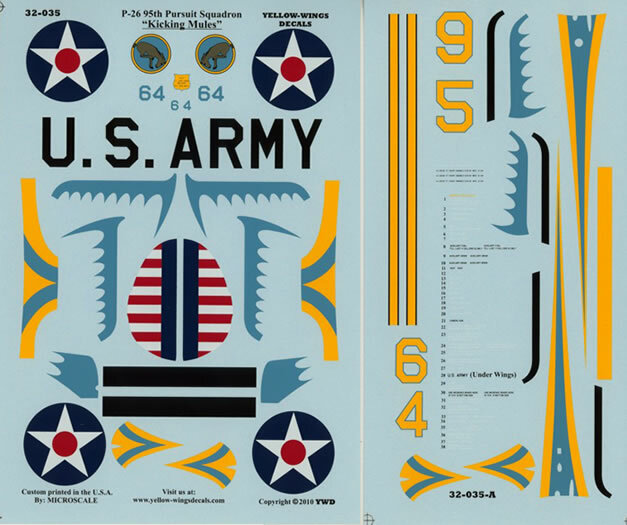 Conclusion: Another three excellent sheets from Yellow-Wing Decals that will provide you with some colourful alternatives for your stashed Hasegawa P-26 kits. 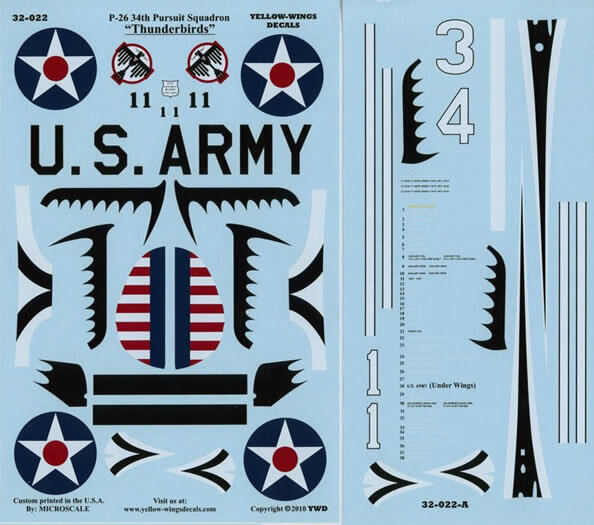 These are the first decal sheets that I have reviewed from Yellow Wings decals although I have a couple of 1/48 scale sheets in my stash. I am quite impressed with this manufacturers decals in particular their theme of pre WWII aircraft schemes. The 1930s was a very colourful era for US aircraft in particular the yellow wing schemes. 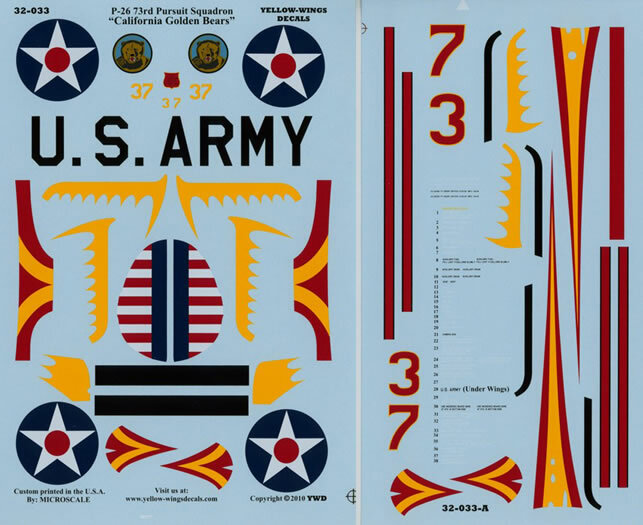 The 3 sheets each contain a set of markings for one US Army scheme of gloss Olive Drab #22 fuselage and gloss Orange/Yellow main wings. The actual decal printing has been performed by Microscale of the USA and the guys at Yellow Wings have done an excellent job of the decal art work and the instruction sheets. The decals are superbly printed with good colour saturation and excellent register. The carrier film is ultra thin and my experience with Microscale printed decals that I have used in the past is that the decals have to be handled carefully and they snuggle down into the surface detail well. I always use decal setting solution but this is not necessary with Microscale decals. The carrier film then almost totally disappears under a coat of clear. A set of data decals is provided as well as detailed profiles displaying data decal placement and some reference notes pointing out all the colours required for each individual aircraft. The squadron colours and national insignia are all supplied as decals including the tail plane and fin scalloping that would be very difficult to paint. Boeing P-26A 1934-35 17th Pursuit Group, 34th Pursuit Squadron. This aircraft has the squadron colours of black and white. Boeing P-26A 1934-35 17th Pursuit Group, 73rd Pursuit Squadron. This aircraft has the squadron colours of red and gold and is probably one of the most striking schemes. Boeing P-26A 1934-35 17th Pursuit Group, 17th Pursuit Squadron. This aircraft has the squadron colours of blue and gold. The decals are designed for the old Hasegawa 1/32 scale Boeing P-26A which had some nice schemes and reasonable decals but these sets from Yellow Wings outclass the old Hasegawa decals by a large margin. The only issue now is the decals are son nice I need to find a few more of the old Hasegawa kits to put them onto. Thanks to Yellow Wings Decals for the review sample.